When you go to a museum and you look at a piece that puzzles you, you often look to the left of the artwork to read what the curator has to say about what the piece represents, the inspirations it draws from, and the clear reasons of why it matters. It helps us to better understand its significance and we sometimes need that. Often I feel the same approach it taken when accompanying new music in the form of a “let me introduce you to this new band” one sheet. This one for DieAlps! 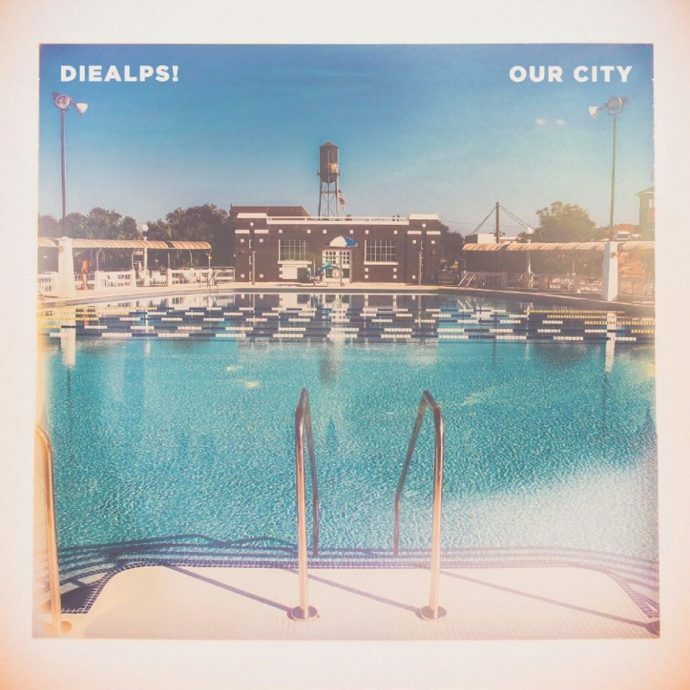 (pronounce “dee alps”) Our City promised emotions that deal with adjusting to changes that come with growing up and moving away while playing homage to favourite 90’s bands such as Radiohead and Pavement, Yuck and The Shins. The first two is a stretch although draws to mind one Radiohead track in particular, “Anyone Can Play Guitar” and I am certain they took that sarcastic sentiment to heart. The latter two bands weren’t even part of the 90’s music landscape, which makes one wonder if they truly understand their supposed influences. Upon listening to Our City I’m sorry to say that you can clearly tell that aren’t even sure of their own sound. They run back and forth on every other track like a whiplashed ping-pong game between electric guitar driven, cymbal clanging rock numbers with whiny vocals to sweet, dreamy songs. Actually the best tunes are these softer offerings–simple, lovely little pop ballads you could waltz to such as “Mayfly”, “Dwight”, and “Battles.” There are cool guitar wah–wah effects all over the place but they always feel out of place. The piano parts lift the music up when it isn’t being overpowered. Okay, let me try to become a curator for a moment…perhaps this technique represents the internal struggle between the place one has always called home and the one you create in a new place. Or it could be a metaphor for the wave of emotions that wash over our ever changing moods from turbulent feelings of anger or doubt to that of pure bliss and discovery. We can all relate to that! Despite my attempts to find common ground it is difficult to make a connection to this album. The first track, “Running Into Walls” barrels in with their “signature” ¾ time and runs across the rest of the tunes until the end with “We Fought The Sea” that ends abruptly as if to say “that’s all we’ve got to say about that”. “Get Yours” starts off promising and then fizzes quickly out once the singing comes in, changing the entire direction of the sound they opened the song up with. The bridge in “In the Country” also goes down a path that could have been interesting if they only brought it in sooner and experimented further with it. With these types of sample tastings, which be heard here and there throughout the album, there is hope for growth and hopefully the opportunity to become a band with their own unique sound. For now they sound like another generic eastern European pop band. “You’re just another book on the shelf” they sing in “Dwight” and unfortunately so is DieAlps!’ Our City.